ChannelLock's tough and thoughtfully designed combination screwdriver outperforms similar tools. Why You’ll Love It: The ChannelLock 13 ‘N 1 combines the efficiency of a ratcheting screwdriver with the versatility of a multi-bit driver, and you’ll feel the difference from the very first turn. The smooth-action ratcheting mechanism excels, and the tool’s innovative bit storage is a refreshing change from the jumble found on many competitors’ products. ChannelLock brings a rich history of high-quality tools made in America, and in 2011 the company introduced a pair of screwdrivers, including the all-new 13 ‘N 1 Code Blue. A 28 fine-tooth ratchet positively zips through each position as you work. Delivering 225 in. lbs. of torque, the Code Blue surpasses the popular Kobalt Double-Drive, which produces only 178 in. lbs. Conveniently, the direction setting can be adjusted one-handed, and the driver can ratchet left, right, or be locked in place. ChannelLock implemented slide-out bit storage that secures each individual bit—a thoughtful touch compared to the unorganized, loose storage most DIYers find on combination screwdrivers. 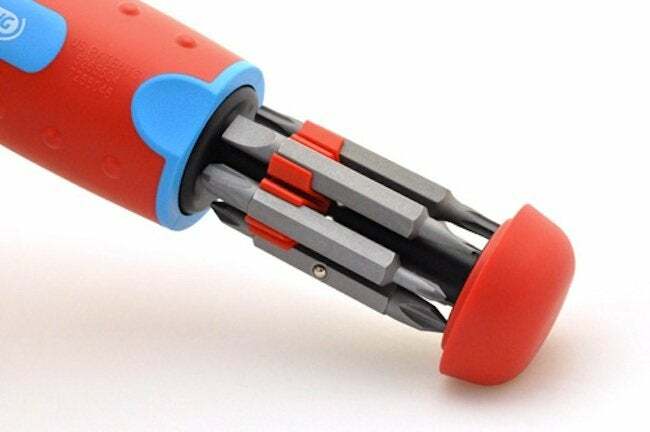 The shaft is a 1/4″ nut driver, and within the handle you’ll find double-ended 0, 1, 2, 3 Phillips bits; 4, 6 slotted bits; 10, 15, 20, 25 Torx bits; and 1, 2 square bits. The ChannelLock 13 ‘N 1 is priced from $30 to $35. Find it online and at your local home improvement center. Author Bio: Ethan Hagan is the primary editor at One Project Closer; visit to read additional tool reviews, expert project guides, and more. OPC is unique in that just about every how-to article features the work of an experienced professional contractor.